The nearly 7,000 graduate students at MIT are one of the most talented scholarly cohorts in the world. Their educational experiences on campus go beyond just research. In April 2017, when Chancellor Cynthia Barnhart brought together the offices of graduate and undergraduate education into the new OVC, the goal was to enhance existing services and identify new ways to provide every student, from orientation through commencement, with an exceptional student life and learning experience. To help us meet our charge, we have been listening and responding to the ideas and concerns of MIT’s graduate students, and we have started to build stronger connections between members of the OVC team and the Division of Student Life (DSL). enhancing diversity and inclusion, advising, and professional development programs and services. 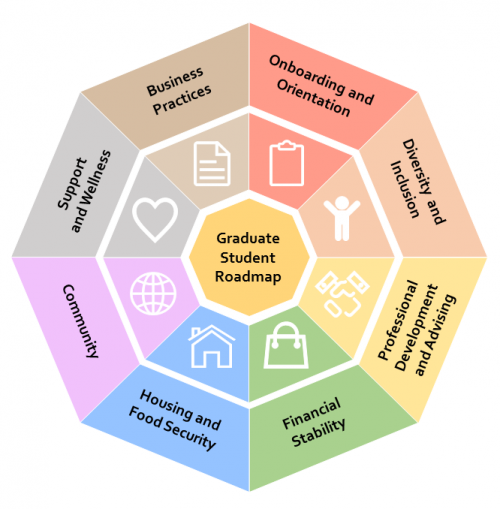 To achieve our goals, we have launched a series of initiatives, known collectively as the Graduate Student Roadmap, as part of a strategic effort to improve the graduate student experience at MIT. As we work to bring these initiatives to fruition, we are committed to leveraging transparency, community ideas, and resources from across campus to make, track, and report on enhancements in these critical areas. In 2019, OVC launched a quarterly e-letter to share progress on various grad initiatives, highlight useful resources, and enhance transparency and open communication between OVC and our graduate students. Following a successful pilot in spring 2018, all incoming graduate students were granted access to Atlas for Grads, an online portal for administrative systems, resources, and information. As part of the broader strategic effort, Vice Chancellor Ian A. Waitz announced a new Parental Leave policy for all graduate students, along with a set of Frequently Asked Questions. In fall 2017, in response to the findings of the Graduate Student Housing Working Group’s interim report, MIT committed to add at least 950 beds to our 2016-17 graduate housing stock and to conduct a rigorous assessment of needs every three years, and an annual review of progress. The Graduate Stipends Committee, comprised of students, faculty, and staff, established a 3% increase in 2018-19 stipend rates. The MindHandHeart Department Support Project is working to make MIT’s academic environments more welcoming, inclusive, and respectful. A Career Explorations Committee of students, faculty, and staff is developing proposals on career exploration and services. Current programs are being assessed by a Graduate Student Professional Development Working Group.